Ever got this message and wondered what does it means? 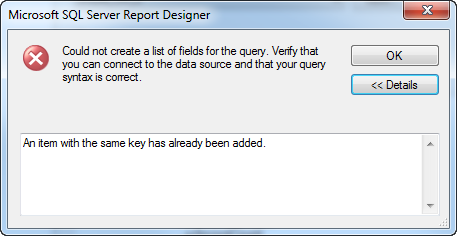 The query works fine in SSMS but fails to refresh and update the column names in SSRS !! It happen to be that I've used the same column names in my query, but SQL handled it as I was using a table prefix in my join. Just alias your column names !!! and remember not to select * !! !